You have stumbled upon our Shoot Out page. 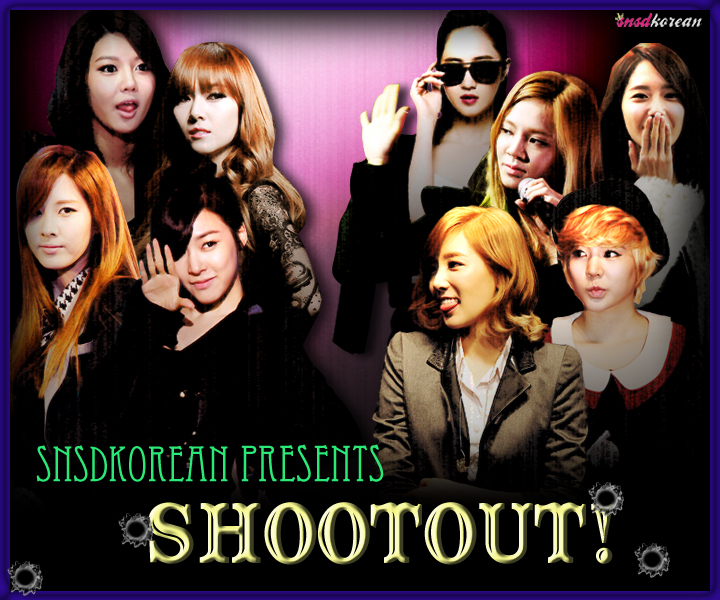 Prepare for mind blowing awesomeness in a detailed discussion of the DO’s and DON’Ts of SNSD. This show is not regularly scheduled for recording but more of a “WHAT’S-HOT-NOW!” segment. If it’s hot in the streets, chances are we’ll be recording within a day or two, so keep your eyes on the look out for Twitter updates –we could be recording at ANY TIME. This show is also more explicit than our regular podcasts, so it is not recommended for the sensitive and immature. Yoona, saranghyeo!! I,m from malaysia,. i love yoona, YOONA FIGHTING! tiffany..i love you! !i’m your big fan.. Please come to Singapore for world tour SNSD!!! SNSD!!! I’ll be here waiting for you in Singapore!!! SOOOOOYOUNGGGGG!!! Saranghae!!! I love sooyoung too! Happy 5th anniversary! i love jessica she is my fav. i really like GIRLS GENERATION but im also super big fan of YOONAH………..